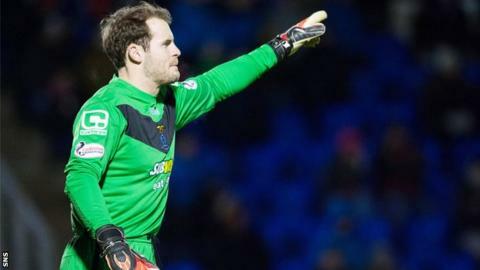 Goalkeeper Owain Fon Williams has signed a three-year deal with Inverness Caledonian Thistle. Fon Williams has been included in Wales' 29-man training squad for this summer's European Championships. He joined Caley Thistle from Tranmere Rovers in July 2015, and has started all 38 Premiership games this season. "As I've always said since arriving at ICT, it's a great place to play football and a beautiful part of the world to live," said Fon Williams. "The people that I work with every day at the football club have made my decision to stay a lot easier. "Now I'm looking forward to the summer and meeting up with the Welsh Squad ahead of the European Championship 2016 in France. The coming season looks to be exciting and I'm sure the fans and the rest of the players are equally looking forward to it." The Highlands club parted company with manager John Hughes last week, after tensions between the boss and the board escalated over next season's budget, and the loss of key talent. "It's great to have got this finalised before Owain heads to meet up with the Wales squad in the next couple of days," said ICT chairman Kenny Cameron. "He has been a fantastic addition to our squad here in Inverness and to have him commit to the club and the Highlands for a further 3 years is brilliant for everyone. "We're also very proud to have a Caley Thistle player in strong contention for a place at Euro 2016 this summer; we wish Owain and the Wales squad all the best and look forward to seeing them in action."